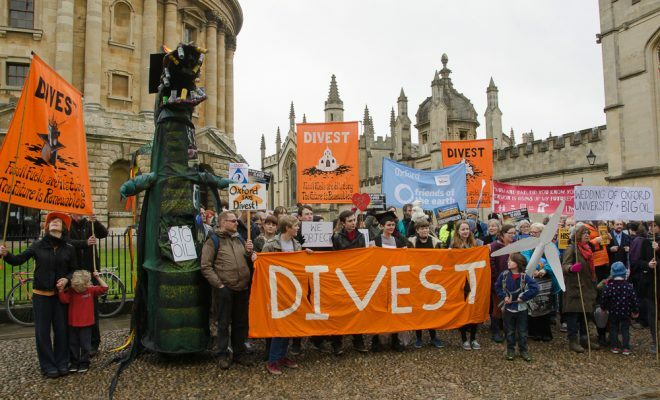 Public relations campaigns to “combat” the growing movement against fossil fuel divestment were a primary topic of conversation when the annual Oil and Money conference gathered last week at the luxurious Intercontinental London Park Lane hotel. The conference opened on the same day the Intergovernmental Panel on Climate Change issued its landmark report  on pathways to 1.5°C average global warming. “The three-day meeting—a ‘who’s who’ of the global oil and gas industry—is co-hosted by the New York Times Company and Energy Intelligence and is attended by more than 500 senior level executives from the industry,” DeSmog UK reports. “The overwhelmingly male lineup of speakers includes some of the most influential CEOs in the oil and gas sector,” including Bob Dudley of BP , Ben van Beurden of Shell, and Patrick Pouyanné of Total, plus senior executives from Chevron, ExxonMobil, Glencore, and Saudi Aramco. International Energy Agency Executive Director Fatih Birol, the U.S. State Department lead on energy and the global oil industry, and several investment bank executives rounded out the participants’ list.